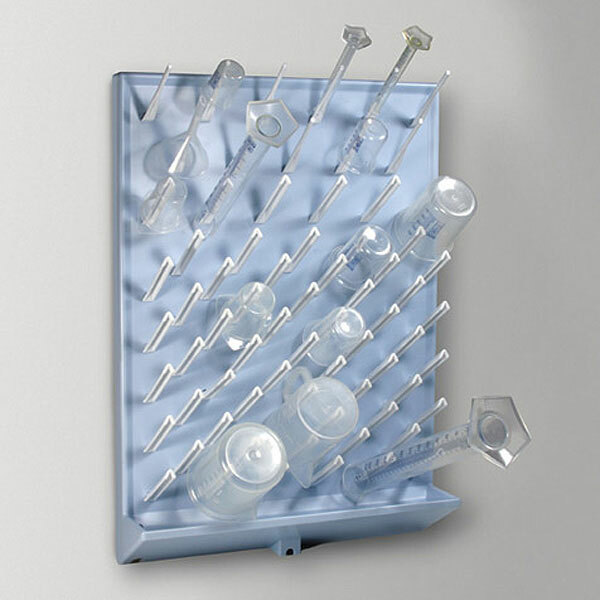 This 72 place wall mountable laboratory drying rack is perfect for draining and drying of all types of labware. The rack comes with a mounting kit to hang on the wall. The back plate of the support is made from a single mold of 4mm rigid high impact polystyrene (HIPS). The peg sockets have closed ends eliminating leakage and consequent biohazards. The seamless drip channel collects waste which drains via a supplied drain tube. The 72 (push in) pegs can accomodate items with a 15mm+ neck bore. They are easily removable for cleaning or to accomodate odd shaped items. Also included are 11 small pegs to accommodate small diameter items with a neck bore of 6mm+ (such as test tubes). This durable rack will not rust or stain.